This is included one of the four new tools found in 13 tool all-in-one Story Mechanisms, now being sold separately. This is intended to be a paid upgrade to work with plots, fact generator, and settings most directly. This table shows verbs listed in somewhat order: verbs that do, move, social, setting, object, and idea - thought some can be used in many ways. These are meant to help describe what is going on in a scene, which may or may not relate to the plot. Roll to find a verb to help describe a setting or scene. This is a action generator that is meant to aid or take the place of a Gamemaster (GM) for adding scene verbs. It may also be used as a list of ideas. 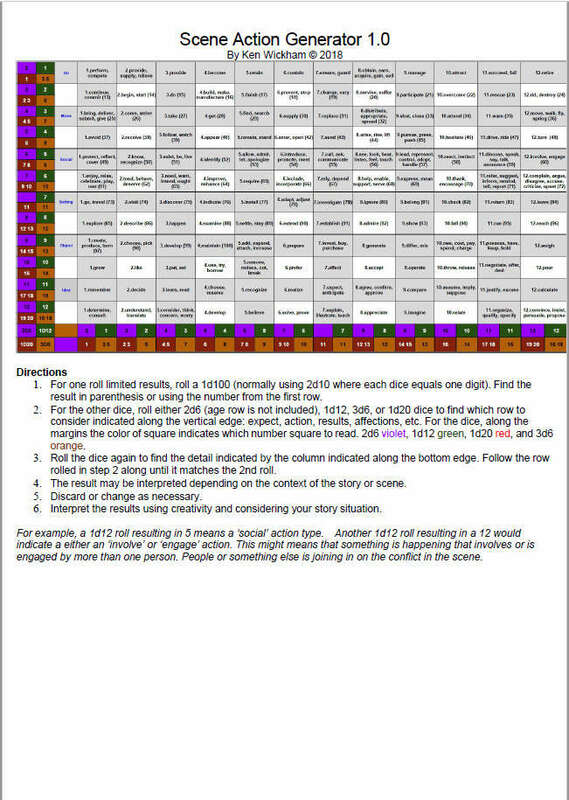 A 12x12 table optimized for 1d12 but with results for 2D6, 1D20, 3D6, and D100 (percentile) systems is included. It makes it a versatile twist generating engine. Included are a total 144+ verbs in the entire table.